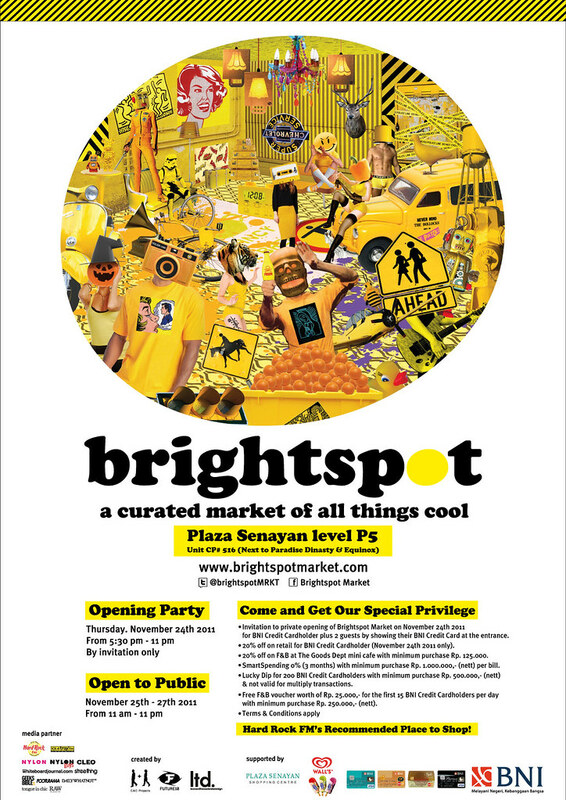 For the first time, Brightspot Market will be held in the luxurious PlazaSenayan, filling 3,500 square meters of raw space in the former bowlingalley location. With more than 130 booths, visitors will find tons of the coolestproducts from a number of Indonesia’s most creative entrepreneurs alongside some of the biggest international streetwear brands. Several never-before-seen brands will be launching their very first collections at this event,while many returning vendors will be introducing their latest season. The four-day event will kick off with an opening party (invitation only) onThursday, November 24th, 2011 from 5:30-11 PM. Doors will be open to thepublic from November 25th- 27th from 11AM-11PM. As usual, we will havecontinuous musical entertainment from some of Indonesia’s best DJs, as wellas the ultra-yummy bake sale to satisfy your sweet tooth. Looks like a awesome event !